In an interesting recent article Richard Cross has argued that a body may be said to be substantially present at a place distinct from the place that it occupies if it brings about immediate causal changes at that distinct place. (Richard Cross, ‘Catholic, Calvinist, and Lutheran Doctrines of Eucharistic Presence: A Brief Note towards a Rapprochement’, International Journal of Systematic Theology, Volume 4 Number 3, November 2002) He uses this argument in an endeavour to develop a plausible and coherent account of Eucharistic presence, one that would have an attraction to both Roman Catholic and Lutheran views, and one that (he believes) fits the views of Calvin especially well. In this piece I shall briefly examine the appeal that his proposal might have had to Calvin, or might have to someone who follows Calvin’s general approach to the Supper. Christ’s body is definitively present at a place, on this view, if it is both directly or immediately causing a specific effect at that place and yet not spatially present at the place. After all, definitive presence is taken to entail that the whole of the definitively present object is present in each part of the place at which it is present – something Aquinas explicitly affirms about Christ’s bodily presence in the Eucharist. And it is hard to see how this condition could be met in any way other than by talking about the whole body causing an effect at each part of the place where it is present. Thus far, then, Christ’s body is definitively present at a place at which it fails to be spatially present if it is directly or immediately causing some particular effect at that place. He holds that this gives us a sense of bodily presence that is somewhat weaker than Aquinas’s, for it does not entail transubstantiation, and in any case he thinks that Aquinas’s view is not altogether clear. Suppose Christ’s body is capable – by some means or another – of producing an effect at a distance from its spatial location, and that this production can be immediate. And let us suppose that it does so in the Eucharist. If my analysis is correct, this entails that Christ’s body is substantially present in the Eucharist – even though this substantial presence amounts to no more than (immediate) causal presence. In the case of immediate action at a distance, causal presence is a kind of substantial presence; substantial presence, in the case of immediate action at a distance, is reducible to causal presence of this kind. Principle S - If a physical object has immediate physical effects at any place distant from its location then it is substantially present there. With Cross’s help we need to distinguish further between mediate and immediate presence understood in this causal fashion. A king may be causally present in all parts of his kingdom, through his deputies and plenipotentiaries, but not substantially present. Why not substantially present? Because in such an instance his presence is mediated through his representatives. It is not immediate. In the same way, I suppose, the presence of a person’s voice in a room is not a case of the causal presence of that person in the required sense if it is only heard through a radio. As we have noted, Cross supposes a body that may immediately cause effects at some place distant from the substance itself. If so, then such a substance can be substantially present at more than one place, if it produces immediate effects at more than one place simultaneously, just as it can be said to be causally present at more than one place. There is some reason to doubt the cogency of this: Cross’s argument is that there is need to distinguish such immediate presence from the mode of presence proper to a substance that causes effects at a distance only mediately. There is of course a need to make that distinction, but it may be considered to be stretching things to suppose that whereas mediate causal effects do not entail substantial presence immediate causal effects do. Why are there not simply two modes of the action of such bodies, one immediate and the other mediate, without the need to invoke the idea of substantial presence in the case of immediate presence? Invoking the idea of such presence here seems gratuitous, or a case of special pleading. Perhaps we may leave this doubt to one side. If we are troubled by it, however, then perhaps we are denied the conclusion that the body of the risen and ascended Christ could be substantially present at the Eucharist, and that must be considered a defect if we are attempting by it to make a contribution to debates about the mode of Christ’s bodily presence. We shall return to the matter later. Cross is not trying to smuggle anything in at this point. He recognises that on his view Christ’s substantial presence amounts to no more than immediate causal presence. But even if we allow this account of presence to be a case of substantial presence then why is it a view of substantial bodily presence? We see that Cross needs the idea of substantial presence in order to make possible this further step, from immediate bodily effects to substantial bodily presence. So (he claims) substantial bodily presence is the immediate causal consequence of a body at a place when it is not spatially located at that place. But is he entitled to this claim? Once again this seems to be stretching the idea of substantiality. Of course there’s a sense in which ‘substantial’ is used in a concessive sense, as equivalent (roughly) to ‘mostly but not entirely’, as in ‘my views are substantially the same as yours’, but Cross needs a tighter view of substantial than this, one that is essentialist in character, to give him a serous view of real bodily presence, as he himself recognizes. What is interesting to me, however, is that he thinks that this view is applicable to Calvin. He believes that while the account summarized above falls short of Aquinas’s view, for reasons that are not relevant here, it has most in common with Calvin’s doctrine. Here is what Cross says on this. Christ, while remaining in heaven, descends to us by his virtue . . . When I say that Christ descends by his virtue, I deny that I am substituting something different, which has the effect of abolishing the gift of the body, for I am simply explaining the mode in which it is given . . . I say that by that body which hung on the cross our souls are invigorated with spiritual life . . . But as distance of place seems to be an obstacle, preventing the virtue of Christ’s flesh from reaching us, I explain the difficulty by saying that Christ, without changing place, descends to us by his virtue. It is this suggestion that I should like to test out. Even in the case of Calvin, Cross encounters difficulties in successfully deploying his idea, because, as he points out, Calvin is reluctant (this is I believe is rather an understatement, as we shall see), to infer from the causal presence of Christ, and therefore from the causal presence of Christ’s body, that his body is substantially present at the Eucharist. More fundamentally, Calvin wishes to reject the view that the presence is bodily in character. To the giving of the body, its presence is not at all requisite: for as I have already explained, the obstacle arising from the distance of space is surmounted by the boundless energy of the Spirit. We both [i.e. Calvin and Westphal] acknowledge that the body is given; but I hold that a bodily presence is thence erroneously inferred. Calvin’s account differs from mine, however, in two very important ways, ways that are fundamentally, but not wholly, terminological. The first is that Calvin is reluctant to infer from the causal presence of Christ’s body that it is substantially present (‘I have classed among opinions to be rejected the idea that the body of Christ is really and substantially present in the Supper’), or that its substance is present (‘It is one thing to believe that the body of Christ is truly given to us, and another, that his substance is placed under the earthly elements’). The second is that Calvin wants to reject the view that the presence is in any sense bodily. denying these claims, how to distinguish Christ’s immediate causal presence from merely mediate causal presence – the kind of causal but not substantial presence that a king has throughout his kingdom. It may not, however, be much more than a terminological difference, since I anyway want to reduce substantial presence in this case to causal presence. And it is a defect that is easily explained by the context in which Calvin was writing. For it was important for him, for controversial purposes, to try to distinguish his position as sharply as possible from that of Westphal, his Lutheran opponent. As Calvin understands Westphal, the Lutheran’s position involves the view that the substance of Christ’s body is present in such a way that, in effect, it causes its result by some kind of spatial contact. And if this is what substantial presence is, then Calvin (rightly) wants to reject it. Let us try to assess this treatment of Calvin’s view. In doing this we shall leave aside, not considering it directly, a central feature of Cross’s project, that it is an account of the physical efficacy of Christ’s body. It does not seem to me that what Calvin is remotely after, what he is at all interested in, in his account of the Supper, is any account of Christ’s body that has anything to do with the physical efficacy of that body in the faithful partaking in the Supper. Calvin simply does not think in these terms. As we have seen, he thinks in terms of spiritual virtue mediated by the Holy Spirit. But let us leave this to one side and simply assume that this is a mistake. At this point one cannot help noticing a certain strain in the sequence of the argument. First, Cross extends the idea of physical substantial presence to include immediate causal efficacy. Then he notes that Calvin himself would object to the idea of Christ’s physical presence at the Eucharist, and then finally he suggests that this important objection is mainly, though not wholly, terminological, and that Calvin is denying himself the distinction between immediate and mediate causal effects. But why should Calvin permit himself to follow this rather dog-legged route? Why not deny physical substantial presence, in any sense, ab initio, as in fact he seems to do? Further it is not at all clear that he denies Cross’s distinction between mediate and immediate causal presence. He may, quite consistently with his view, allow it, but simply deny that even immediate causal presence entails substantiality. There may be a good reason of a general metaphysical kind to make the distinction. But deploying the distinction, or resorting to it at Cross’s prompting, does not arise as a live option for Calvin since he has no interest in an account of Christ’s physical presence at the Eucharist to begin with. Allowing that Christ’s immediate causal presences were a case of substantial presence would certainly blur his case against the Lutherans. For Calvin, the real presence is only a spiritual presence. Cross’s idea seems to be that Calvin, in affirming a doctrine of the real presence of Christ, cannot affirm that reality as a bodily reality since he thinks that bodily presence entails spatial presence. But the fact is that he is less than keen to think of the real presence in bodily terms to begin with. Calvin is not following this trajectory. He is not hankering after an account of substantial bodily presence and what it entails. As if we were denying that the body of Christ is substantially eaten, by insisting, that he can effect our salvation in a different manner by the agency of his Spirit. Our argument is, first, that when a thing is not necessary, it ought not to be pertinaciously contended for; and secondly that the mode of communication must be learned from the common doctrine of Scripture. Calvin frequently emphasizes this metaphysical aspect. I say that he holds that this is a necessary truth, but he does not actually say that it is. At one point in his exposition of the Lord’s Supper in the Institutes he does say that ‘the body with which Christ rose is declared, not by Aristotle, but by the Holy Spirit, to be finite, and to be contained in heaven until the last day’. Yet perhaps it would not be stretching things too much to say that he takes the Holy Spirit to be making a modal point regarding body and place every bit as much as did Aristotle. From this it may seem that if an account of bodily presence could be offered that denied Principle L (as Cross believes that his own proposal does, or might) then Calvin would favour it, though this belief seems to presuppose that Calvin holds this metaphysical position reluctantly. Perhaps he might favour Cross’s proposal, were it not that he has besides this general argument a host of Scriptural data which, he believes, favours his much more pneumatic account of Christ’s real presence. It is highly likely that if he were to be apprised of Cross’s suggestion about causal presence, he would simply regard this as an extension of the idea of ‘carnal presence’, for the presence in question is clearly intended to be that of a bodily, physical effect. The second argument is to note the prominence that Calvin gives, in his account of what he understands to be the real presence of Christ at the Supper, to the totus-totum distinction. In fact a key element in Calvin's discussion of the sense in which the whole Christ may be present at a place, though not physically present there, (since his human nature is localized in heaven), is his use of this distinction between two kinds of presence, or two understandings of presence, totus ubique, sed non totum. Calvin takes this from Lombard, referring to it in one place as a 'trite' distinction. Not surprisingly, perhaps, the distinction can also be found in Thomas Aquinas, and no doubt elsewhere. In discussing the simplicity of God, Thomas considers the objection that if he is simple it must be possible to comprehend God, since what is simple, having no parts, must be understood as a whole. ‘Therefore, if he were simple, he would be attained as a whole by the blessed, but what is attained as a whole is comprehended’. But of course it is fundamental that the creature cannot comprehend the Creator, and so, the objection runs, God cannot be simple. To which Aquinas responds by deploying the totus-totum distinction. The blessed attain to the whole God, but not wholly. The argument is to grant that since he is simple, God does not have parts, but nevertheless since he is infinite that simplicity cannot be comprehended by the creature. 'It should be said that the whole God is attained by the mind of the blessed but not wholly, because of the mode of the divine knowability infinitely exceeds the mode of created intellect’. This application of the distinction is rather different from Calvin’s, who is arguing that although Jesus Christ has parts, the whole Christ is nevertheless present at the Supper even though ‘all that is Christ’, his human nature, and particularly his human body, is not and cannot be present. Reference to the distinction occurs quite frequently in Calvin’s discussions of the Supper and though he may consider it to be trite it nevertheless plays a critical role in his defence of his own views, as in this paragraph from his Introduction to his Commentary on Jeremiah. But Christ, it is said, sits at the Father’s right hand, which is to be taken as meaning, everywhere, confined within no limits. I indeed allow that God’s right hand is unlimited, and that wherever it is there is the kingdom of Christ; which is metaphorically represented in Scripture by the term sitting: for whatever is declared of God is beyond controversy to be now ascribed to Christ; and therefore to sit, which means to govern the world, is what Christ has in common with the Father; and still more, as the Father by him sustains the world, rules all things by his power, and especially manifests the presence of His grace in governing His Church, He may be said, strictly speaking, to reign in His own person. It hence follows, that He is in a manner everywhere; for He can be limited by no place who sustains and protects all parts of heaven and earth, and rules and regulates by His power all things above and below. When now I name Christ, I include the whole Person of his only-begotten Son, as manifested in the flesh. He, I say, God and man, is everywhere as to His authority and incomprehensible power, and infinite glory, according to what the faithful experience by evident effects, as they know and feel His presence. It is not then without reason, that Paul declares, that he dwells in us. (Eph. 3.17) But to distort what is said of His infinite power, which is evident in His spiritual gifts, in the invisible aid which he affords, and in the whole of our salvation, and apply it to his flesh, is by no means reasonable or consistent. I wish that many of those who are with little reason angry with us, were at least to recall to mind that common and notable saying used in the Papal Schools, “Christ is whole everywhere, but not altogether” (Christus ubique totus est, sed non totum). They may reject it as it is in the barbarous language of Peter Lombard, which is not pleasant to their tender and delicate ears. It is yet wisely expressed, from whomsoever it may have come, and I willingly adopt it. The basic distinction is conveyed by the use of the masculine and neuter forms of totus, the whole, and it is used to highlight two ways in which Christ may be referred to: as he is the whole Christ, and as he is wholly Christ. The whole Christ (totus) is God and man understood concretely, a person with two natures. The whole Christ is everywhere, and so it is possible that by his Spirit he is really present in the Supper. The whole Christ was wholly present during his earthly ministry. But the whole Christ is not now wholly present at any place on earth, since his body is located in heaven. Nonetheless, according to the distinction, although the whole Christ cannot be present, nevertheless Christ may be wholly present. Whatever one thinks of this distinction and of Calvin’s use of it here, it might be said to be tailor-made (as far as he is concerned) to enable him to avow a doctrine of the real presence of Christ while disavowing any suggestion of a physical, ‘carnal’, presence. It is true that Calvin could deploy the totus – totum distinction even were he to adopt Cross’s proposal, for that proposal gives a sense of bodily substantial presence which implies distance from where Christ’s body is located. So it is consistent with Principle S, but nevertheless it is clearly intended by Calvin to uphold Principle L. Calvin uses it to deny that the sort of real presence that, when properly understood, entails bodily presence; it entails real presence but not that mode of presence, a mode of physical presence, which Richard Cross is advocating on his behalf. In his discussions with Westphal Calvin repeatedly claims that his aim is not to deny the real presence of Christ in the Supper, but to understand its ‘mode of reception’, as he puts it. It is spiritual presence, in two senses, in the sense that Christ’s divine nature is omnipresent, and his Spirit unites us to his body, and to his entire human nature. I acknowledge, however, that by the virtue of his Spirit and his own divine essence, he not only fills heaven and earth, but also miraculously unites us with himself in one body, so that that flesh, although it remains in heaven, is our food. Thus I teach that Christ, though absent from the body, is nevertheless not only present with us by his divine energy, which is everywhere diffused, but also makes his flesh give life to us. For seeing he penetrates to us by the secret influence of his Spirit, it is not necessary, as we have elsewhere said, that he should descend bodily. He is so far removed from Cross’s idea of substantiality as immediate causal efficacy that on occasion he seems equally to stress that enjoying the real presence of Christ is not so much a matter of Christ descending as it is a matter of faithful partakers of the Supper being lifted up. So ‘the minds of believers…are raised by faith above the world, and Christ, by the agency of his Spirit, removing the obstacle which distances of space might occasion, conjoins us with his members’ ; true and real communion ‘consists in our ascent to heaven, and requires no other descent in Christ than that of spiritual grace’. From a purely logical point of view, such language might be anticipated from what we have already learned of Calvin’s view. For if Christ’s presence it mediated by his Spirit, it is as possible for the Spirit to mediate the faithful to Christ as it is to mediate Christ to the faithful. The great Baptist pastor/theologian John Gill is generally given the thumbs down at present. I’m guessing, but I think that his has chiefly to do with his alleged ‘hyper-calvinism’, and with the general demise of systematic theology among Reformed or Calvinistic Baptists. I think, also, that his aloofness from the Evangelical Revival does not recommend him to some, though others who were actually engaged in that work, such as A.M. Toplady, rather than those who merely admire it from afar, greatly valued Gill. But his denial of the ‘free offer of the Gospel’, (if indeed he did deny it) is enough to damn him in the eyes of some. There’s also the portrait above, sometimes reproduced in black and white, of a bewigged and sour-looking Gill, which hardly attracts. 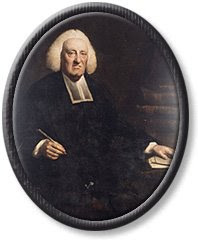 In this Analysis I should like to offer some words of praise for his work, and a short reassessment, referring both to his Body of Doctrinal and Practical Divinity, (1769-70) his mature theological work, as well as his earlier The Cause of God and Truth (1733-8) Besides these there is his multi-volume Exposition of the Old and New Testament and many other shorter pieces of writing, such as his exposition of the Song of Songs, and a number of Tracts, many of which are substantial. But I shall say nothing about these in what follows. It is said that he wrote more than 10,000 pages, all in his own hand. Richard Muller, in his Post-Reformation Reformed Dogmatics, frequently mentions Gill, and he is in my view entirely correct to include him in his magisterial survey of Reformed Orthodoxy. However, Gill is not a scholastic theologian in the true sense. For while the arrangement of his theological work generally follows that of many scholastically-minded theologians, his style is clear and flowing, utilising the technical terms of systematic theology in the same easy, clear, unassuming yet confident way in which he gives evidence of his vast learning. He is a covenant theologian, but while this motif is prominent it is not all-controlling as it is with some of the Dutch covenant theologians. His meaning is generally clear. His style seems to have arisen from his preaching and expositions and his great knowe of Scripture. If the style of John Owen puts you off, (‘a continent of mud’, according to Robert Hall), try Gill. Here I shall briefly try to assess the charge of ‘hyper-Calvinism’. The criteria of ‘Hyper-Calvinism’ are generally thought to be the denial of the place and use of the law in the Christian life, the doctrine of eternal justification, whether belief in the Gospel is a duty, and the denial of the ‘free offer’ of the Gospel. According to Peter Toon, (Hyper Calvinism 145) it’s also characteristic of hyper-Calvinism to deny the distinction between the secret and he revealed will of God, but Gill certainly upholds that distinction. (BDD 71f., CGT 278, 286) What these features appear to have in common is an underemphasis on human responsibility and initiative amounting to a denial of such responsibility in some respects; and of course, a correspondingly heightened emphasis on sovereign grace in election, justification and regeneration. Care is needed in approaching this territory. For while some of these matters, such as eternal justification, are straightforwardly doctrinal, others of them, such as the preaching of the law and its uses, and the ‘offer’ of Christ, have to do with practice, with ministerial or pastoral emphasis. Making an emphasis is a matter of judgment, and does not necessarily indicate the denial, as a matter of principle, of the opposite emphasis. Someone may judge that a situation requires emphasis upon the law, or on warning and rebuffing an enquirer rather than warmth and encouragement. Christ’s teaching about the narrow gate, the fact that many shall strive to enter in and shall not be able (a text that, I imagine, is rarely preached on at present), or his rebuffing of the Syro-Phoenician woman, might be said to be tactical rather than principled, as is shown by the warmth of his invitations in other situations. Eternal Justification. Gill discusses justification in two places, in his doctrine of God, and in the application of redemption. His discussion of the doctrine of God is in terms of a distinction between the eternal being and decrees of God, (Books I and II) and the external works of God , creation, providence and redemption in time. (Book III-VII). He provides a vigorous defence of eternal justification, appealing, among others, to Ames and Thomas Goodwin, and arguing against Turretin. God’s will to justify his elect is his justification of them (203); this will ‘resides in the divine mind, and lies in his estimating, accounting and constituting them righteous, through the righteousness of his Son….from eternity’. (203) But there seems to be a bit of confusion here. God’s decree of election is his electing of his people; but it is hard to see how the decree to justify his people is their justification, any more than decreeing the building of the Tower of Babel is the building of it. Strictly, God’s decree is not ‘of justification’, but ‘to justify’, something which, Scripture tells us, takes place in time; in Christ, who was raised for our justification, and through faith, which gives us peace with God. Gill does not deny, of course, that there is a sense in which justification takes place in time, but that sense is modified somewhat in the light of his formulation of eternal justification. He denies that faith is in any sense the cause of justification, not even the instrumental cause (204), and faith is the ’evidence and manifestation of justification’. (204) Earlier, in CGT, he seems to allow an instrumental role to faith; it is the hand by which the promise of pardon is received. (e.g. 288) Perhaps he changed his mind. But in a discussion later in BDD, in his treatment of faith, he states that faith ‘receives the blessing of his justifying righteousness from him (Christ)…faith puts on the robe of righteousness and rejoices and glories in it’. (743). So there is some wobbling here, some inconclusiveness. For a reason which is not clear Gill expends a disproportionate amount of effort to maintaining and vindicating eternal justification. Still, even if Gill does hold to eternal justification, this seem to be a mark of ‘high Calvinism’ rather than ‘hyper Calvinism’, certainly not a decisive feature on the ‘hyper’ issue. Thomas Goodwin is not routinely thought of as a hyper-Calvinist even though he espouses the idea of eternal justification in his Objects and Acts of Justifying Faith. The 'Free Offer'. From time to time there is agitation about the ‘free offer’, and even the precise language that the preacher may permit himself to use to the unconverted. Perhaps he may say, speaking generally, ‘God loves you’, or even ‘Christ died for you’; and perhaps it is better not to say ‘Christ died for you’ but rather ‘Christ is dead for you’. Or perhaps not. But it looks like this road leads only to the briar patch. Obviously no single sentence or short formula will do the trick, since what a person says in the pulpit or elsewhere depends upon what else he says, as we have already seen. What of Gill himself? At least in his Body of Divinity he underlines the importance of preaching to men and women indiscriminately. For example, ‘He hath set for Christ in his purposes to be a propitiation through faith in his blood for the remission of sin; and he has sent him to shed his blood to obtain it, and has exalted him as a Saviour to give it, and to him give all the prophets witness, that whosoever believes in him shall receive it’ (733) And he has a robust attitude to evangelism. The ministry of he gospel is ‘for the enlargement of the interest of Christ in the world; and it is by means of the gospel being preached to all nationals in all the world, that the kingdom of Christ has been spread everywhere...’ The ministry ‘is for the conversion of sinners; without which churches would not be increased nor supported, and must in course fail, and come to nothing’. (931) There are places in which Gill rejects the ‘free offer’ the 'offer, or tender of the new covenant' but appears to distinguish this from 'offers of Christ, and tenders of the gospel' which he also distances himself from, though in less robust terms. (CGT 339). I hope in the near future to post an Analysis on the 'free offer', which might be the place to look at Gill further. Idiosyncracies and emphases which we may regard as unguarded and in need of qualification are not a sufficient reason for us to close our minds to all that Gill has to offer. In the next Analysis we shall look at what Gill says about obligation and ability in his The Cause of God and Truth. Recently it happened that I found myself in two enjoyable and stimulating discussions of the person on Christ, particularly of his temptation. With hosts of others, and with the historic church, I am strongly inclined to hold that in the incarnation the essential deity of the Logos was undiminished (even though his glory was hidden). And further to hold that the Logos who became incarnate is impassible, ‘without body, parts or passions’; he has an immutable and fully impassioned divine nature. Such convictions make it tempting to gloss the Gospel narratives in the following way. Take the case of Jesus’ embodiment. Jesus, wearied as he was from his journey, sat on the side of Jacob’s well at Sychar. (John 4) Jesus is God. Jesus is weary. Is God weary? No, God is not weary, nor can he be. So maybe we should say: as God Jesus was not weary, but as man he was weary. Similarly, with the passion of Christ. In Mark’s gospel we have ‘And he said, “Abba, Father, all thing are possible for you. Remove this cup from me. Yet not what I will, but what you will”’. (Mark 14) Does Jesus, who is divine, have a will that is even fractionally at odds with the will of the Father?’ No, not possible. So should we say, perhaps, as God his will was entirely at one with that of his Father, for he has the same will as his Father, God’s will. But as man his will could deviate from that of his Father, and that (though for only one dense, intense, moment) on this occasion he had it in mind to deviate from the will of his Father? (We might then go on to discuss how it can be that such a deviation is possible in one who is without sin.) As God he was one with his Father; as man his will could deviate from that of his Father; it was not perfectly aligned. Such a strategy, the ‘as man…..as God…..' strategy, as we might express it, has its attractions. It does justice to the doctrine of the person of Christ as two natured; a divine person, with a divine nature, taking on human nature, yet without sin. If you carry out this strategy you are in effect preserving or protecting the integrity of the natures. And so in this sense you are confessing a true Incarnation. There are attractions of other kinds: it’s a tidy, neat solution to those perplexities which inevitably come to mind as we read the gospels. It shows that we are being theological alert. It’s a piece of good theological housekeeping, perhaps, and if you are analytically minded it has an additional appeal. But I wonder. Is this strategy not a bit too neat? Why should that be? Is this the direction that the New Testament, Paul especially, encourages us to go? Whatever help this is over the distribution question - and it certainly provides warrant for raising the distribution issue in the first place - we do not have an inkling what it was like to be the Incarnate Son. We possess no descriptions of his stream of consciousness, of what it was like to be Jesus “from the inside.” Jesus does not tell anyone. Nevertheless there is a strong emphasis on the unity of that consciousness; there is no intimation of a divine-human split-mindedness, nor any evidence of an oscillation between the two natures or the two wills, except in the Passion. Not even in the wilderness temptation. Reading the Gospels with this in mind there is a strong tendency to think that this unity of consciousness reflects a seamless unity of the divine and human in the person of Jesus. Unity of person, unity of consciousness. Calvin seems to offer another approach to this when he says that in the incarnate Christ the divine nature was ’in a state of repose’ (or that he was concealed) whenever the human nature had to act separately in the discharge of the office of Mediator. The human nature of the Logos was revealed in action, the divine nature was concealed. Perhaps so. This may be consistent with the reserve of the Gospels, but is the church redeemed by a Saviour whose divine nature was resting or concealed once the Incarnation had occurred, and who only occasionally went into action? Does not the Incarnation reveal the character of the divine nature, not conceal it? And what of Paul? He certainly writes about the two natures of Jesus in the same breath, as in Romans 1 or Philippians 2. But there is no attempt to explain the concurrence of the two natures, in the way in which say he explains the place of faith in justification, say, or the church as the body of Christ, or the fact of the resurrection of the body. The same is true of John, as when he says that he who was from the beginning was seen and handled. How could this be? John does not tell us. There are, it is true, too much-discussed texts, Acts 20.28 and I Cor. 2.8 which if taken literally imply that God has blood and that the Lord of glory can be crucified. Calvin, with others, takes these to be rhetorical, economical expressions, justified by the unity of the divine and human in the person of Christ. Returning to the ‘as man….as God’ strategy, suppose that we are astute enough to say that as the eternal God, though fully impassioned, Christ cannot suffer, but as man, even man united to God, he (manifestly) can. This is tidy, but when we have carried out that strategy what have we learned about the passion of Christ, or his possession of a body that could get tired and needed sleep? What light does such a strategy throw on the relevant passages? Any at all? Perhaps no light from anywhere can help us with these passages. Maybe there are occasions when our talking ought to stop. This strong language of Hilary of Poitiers (c.315-368) was on one occasion quoted by Calvin with approval. The guilt of the heretics and blasphemers compels us to undertake what is unlawful, to scale arduous heights, to speak of the ineffable, and to trespass upon forbidden places. And since by faith alone we should fulfill what is commanded, namely, to adore the Father, to venerate the Son with Him, and to abound in the Holy Spirit, we are forced to raise our lowly words to subjects that cannot be described. By the guilt of another we are forced into guilt, so that what should have been restricted to the pious contemplation of our minds is now exposed to the dangers of human speech. Such an attitude is uncomfortable to modern people. In the day of freedom of information laws and a news-hungry media and scientific advance, we want to know; we are entitled to know. There is a never-satisfied appetite for news and views, and not only among the ‘intellectuals’ or the literati. And, of course, the church picks this up. We have a right to know. We think that those without answers must be hiding something, that the absence of an answer is a refusal to come clean. But there’s a place for silence, for reserve, for active meditation, for ‘the pious contemplation of our minds’. A time to keep silence, and a time to speak, as the Preacher said. What better time for keeping silence than when we are confronted by the Incarnation? Mediator between God and men, he His Deity equal with the Father, in His flesh, i.e. in His human nature, inferior to the Father, — unchangeably immortal in respect of the divine nature, in which He is equal with the Father, and yet changeable and mortal in respect of the infirmity which was His through participation with our nature. ‘The Word became flesh’, ‘The Son of God became a baby’, ‘God became man’. These simple English sentences express the mystery of Christmas, the mystery of a true Incarnation. Like other biblical mysteries, we can state simply what the mystery is, using words that a child can grasp. Yet what we express remains unfathomable to the most brilliant of creaturely minds. ‘Great indeed….is the mystery of godliness’. (I tim.3.16) ‘Thanks be to God for his inexpressible gift’ (2 Cor. 9.15) Why is this? What makes the Incarnation so mysterious? To try to answer that question, we must ask another one: What is a true incarnation? It is God becoming man, taking on human nature – not just a human body, but human nature, body and soul – while remaining God in a wholly undiminished way. We must not think of the Incarnation as the elevation of a mere man. The direction is the other way: not the raising of mankind, but the coming down of God, his condescension. God comes down to us, taking our nature, but remains God in doing so. This last point is vital for our understanding of the mystery. God became man not in the sense in which a table becomes ashes or eggs become an omelette, but more in the sense in which a man and a woman becomes a husband and a wife when they are married. They remain a man and a woman, but in marrying they enter into a new relation. In a similar, though utterly unique, way the Son of God remains the Son of God and yet enters into a new relation. He becomes united to human nature in the person of Jesus Christ, the Mediator, the God-man. In this union he is so closely united to us – in the closest possible way - that the Incarnation is best thought of as the incarnation of one person with two natures, not (as in marriage) a union of two persons who yet remain distinct. The Incarnation is a mystery quite simply because it is unparalleled in our thought. Not simply a one-off, but a one-off that we cannot get our minds around. Earthly relationships and connections can only be faint analogies of what happened at the first Christmas. In becoming incarnate God condescends to us. The condescension takes this form: the love and grace of God is seen in being as closely united as it is possible to be to human nature and to all that human nature can undergo – degradation, temptation, weariness, weakness, - yet without sin. God so loved the world that he gave his one and only Son to be incarnate, and in his human nature to suffer these things. In the fact of his suffering, and the manner of it, and the reason for it, we see the glory of God revealed. But not only is the love and grace of God seen, but his purity and holiness and justice too. For our servant king is born to die. There is a temptation to focus on the baby in the manger as if he were like any other baby. But while baby Jesus was a true baby, he was not only a baby. That’s why it is necessary to concentrate not only on what we think we can picture or visualise about baby Jesus, but on what the Bible tells us about the significance of what we can picture, what it means. We need to focus not only on the events, but also to pay attention to the inspired commentary on those events. The commentary of the angels, and of the godly remnant – Elizabeth, Zachariah, Anna, and especially of Jesus’s mother Mary - of the writers of the Gospels, and of Paul and the other Apostles. So Jesus Christ is what you get when God condescends to us in this way. Veiled, but not blotted out, not wholly hidden – ‘And we have seen his glory, glory as of the only Son from the Father, full of grace and truth’. (John 1.14) Somewhat paradoxically the veiling is also a revealing of God. For it tells us what God is when his glory is ‘refracted’ by being in union with human nature. Just as a light bulb is one way of showing us what electricity is like, and an electric shock is another way, so the Incarnation is the God-ordained way of showing us what God is like. He who has seen me has seen the Father. Not only of course is his love and compassion revealed, but also his power over nature. God is also revealed by Jesus’s emotional reactions to the sin and shame of his earthly environment – anger at the money changers and at the hardness of heart and unbelief of the Jewish religious leaders, and deep shock and sorrow at the effects of death on Lazarus and the funeral crowd. And seen in his steely determination to accomplish his Father’s will by his resistance to temptations, including those of his closest disciples, and never to cease to realise his goal as the Suffering Servant. At Christmastime we are tempted to think that the events of Christmas are the whole story, or to think of a great beginning leading to a tragic end. But Christmas was an event in real time. It is not the illustrating of an eternal value, like good will or humility, or not merely that. For in becoming incarnate the Son of God has begun a ministry which has not even now run its course. He will come ‘a second time, not to deal with sin but to save those who are eagerly waiting for him.’ (Heb. 9. 28) The first Christmas is over and done with. We can recall it, but not call it back. The Incarnation was the beginning of Christ’s earthly ministry; as the Mediator he is crucified, risen and ascended, and in all this God’s grace and glory is revealed. This is what is meant by calling Christianity a ‘historical’ religion; real events are at its heart. Here and now we await the risen Saviour’s coming in great glory. This is important for a true understanding of Christmas. The Incarnation is not an event that simply embodies certain human ideals, such as love and self-giving service. It is the visible beginning of God’s mighty acts of redemption. There’s a temptation at Christmas to think that the Incarnation is happening all over again. But it cannot be. It occurred in real time, and we live in the light and benefit of it, with more happenings to come. Only then will the scope of the glory and significance of the Incarnation be truly appreciated. We round off this short series of Analyses on the importance of logic in understanding the Christian faith with some remarks on causes and conditions. When we use if-then sentences we enter territory that can be very complicated. If George had run harder then he would have won the race. It is important to stress that these differences are not simply differences in the English language. They are differences in thought, fairly fundamental ones. The different sentences express different types of thought, and any language with a sufficiently nuanced grammar and vocabulary will be able to provide translations of these English sentences. To study them in English or in some other language is to try to discover more about what our various thoughts mean. This is very important when we read the Bible. Our study of the Bible, if it is to provide us with an understanding of the thoughts expressed in its pages, cannot stop at the study of the original languages, important though that is. For the same need for reflection that arises in trying to understand if-then sentences in English arise in the case of their equivalents in Greek and Hebrew. A study of the Greek gives us the lexical meaning of nouns and verbs etc., and of sentence construction. But for the implications of if-then sentences containing Greek nouns and verbs we need to think about logical structure, and this takes us away from lexical meaning and grammar and into what the implications of certain Greek sentences are for thought, what different thoughts may be being expressed by one and another of these if-then sentences. Put in a rather grand way, in studying sentences in this fashion we then start to think about reality and what it is about reality that these sentences tell us. The idea that there is purely biblical thought, purely distilled from the original text, and distinctive from any other text all the way down, so to speak, is connected with the belief that such biblical thought is easily contaminated or infected by ‘Greek ideas’, ‘western logic’ or whatever. This also is so much tosh. Restricting ourselves to the words on the page, and with lexicons and grammars in our hands, together with a whiff of extra-biblical knowledge about (say) Second Temple Judaism or ancient treaty forms, are not sufficient to tell us what the text means. It has to be recognised that comparing Scripture with Scripture is of positive help, because this discipline introduces us to the variety of expressions, including the variety of logical forms, in Scripture. But we need also to identify these different forms in abstraction from the text, and to acquaint ourselves with them. So when, for example, we encounter some if-then sentence in Scripture, we need to reflect upon what sort of an if-then sentence it is. Further study of Greek and extra-biblical history won’t, at this stage, help us much. We need, in addition, some logic. In fact, the only prospect of truly theological exegesis arises if the exegete is prepared to compare Scripture with Scripture in coming to the meaning of any text, and if he has an approach to logical form that is not naïve. The need to compare Scripture with Scripture is obvious, but not easy. Theological exegesis is global. That is, it offers the contribution of the meaning of one text or passage to the meaning of the whole of Scripture, and the contribution of the whole of Scripture to it. A large, never-ending task. Without this process of comparison and control, exegesis becomes faddish. Besides this inductive approach to every word that proceeds from the mouth of God, we need a further dose of logic to help us understand these connections and disconnections and to engage in the harmonisation of the whole. But we also need some prior understanding of what the Bible is about, what is central and what is peripheral. It is irresponsible to take any old text and draw inferences from it; we need to have due regard firstly to the context in which the text occurs, then to ‘the analogy of the faith’. Hence the Westminster divines wrote of ‘good and necessary’ inferences. The inferences must be drawn from ‘good’ texts – texts that are clear, central and relevant to the topic in hand. The logic that we need is not complex, because in the Bible we are dealing largely with non-technical language, not the specially regimented language of the formal logician. The distinctions that the theological exegets prods and pokes often occur in ordinary conversation. Signifies, , Surely, Num 14.23. Whether or no, Gen. 8.8. When, Judg. 21.21, John 12.32. It denotes  A condition, Deut. 28.15. Luke 9.23. A supposition, Rom.4.2. 1 Pet. 3.17. A reason of a matter, Eph. 4.21. So then, according to Cruden, there are three different kinds of if-then sentence in Scripture, ones that express either a condition, or a supposition, or a reason of a matter. Deut 28.15 reads ‘If you will not obey…then all these curses shall come upon you’ Likewise ‘If anyone would come after me, let him deny himself, and take up his cross daily and follow me’ (Lk.9.23). These verses certainly express (as Cruden says) a condition. ‘For if Abraham was justified by works, he has something to boast about’ (Rom. 4.2) and ‘For it is better to suffer for doing good, if that should be God’s will, than for doing evil’ (1Pet. 3.17) are suppositions, that is, if-then sentences where there is some doubt about whether or not the if-clause has been or will be fulfilled. Finally there is ‘a reason of a matter’: ‘Assuming that (that is, if) you have heard about him and were taught in him, as the truth is in Jesus.’ (Eph.4.21) That is, there is sometimes and ‘if’ without an actual or implied ‘then’. It is not necessary to endorse every jot and tittle of what Cruden writes to see the value of his remarks. So far so good. Often in Scripture (as elsewhere) a sentence that is not of the if-then form may imply or be reconstructed as one that is of that form. ‘Therefore, since we are justified by faith, we have peace with God’ (Rom. 5.1) can be understood as ‘If we are justified by faith, (as indeed we are) then we have peace with God’. As we saw at the beginning, there are different sorts of conditions. In identifying certain uses of ‘if’ as conditional sentences Cruden takes us so far, but we need to go further. That is, his striking is sufficient for that effect. is not sufficient. Other conditions, such as the striking of the match, are needed. What’s the use of all this? I answer this question with some others: Is God’s love unconditional? How do you understand this? Is faith the cause of justification? Or is Christ's death and resurrection? Or both? Is God’s command the cause of the creation? Is it the sole cause? What sort of a cause is that?